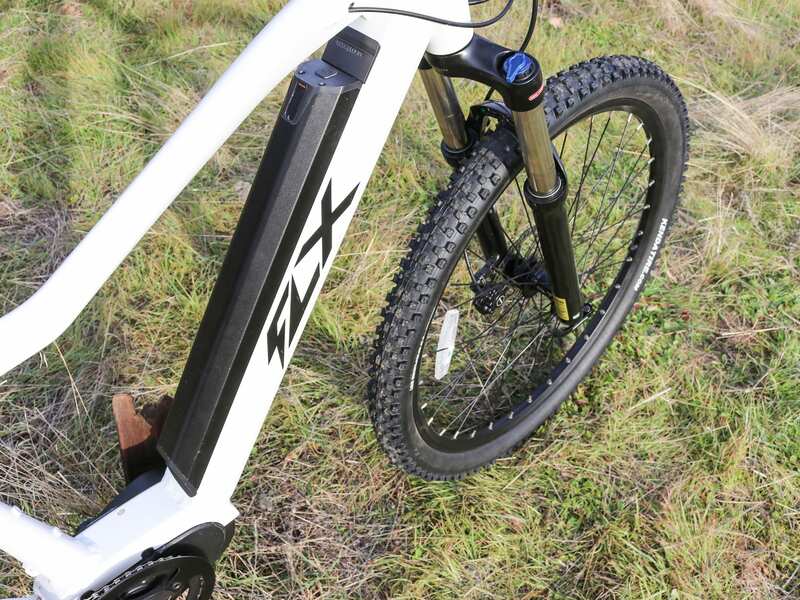 The Trail is the second bike in FLX’s lineup I’ve reviewed so far, and like the Blade, the Trail is a fun, purpose-built electric mountain bike designed with dirt trails in mind. It only comes in one frame size, 19”, but offers three different colors: Electric White, Carbon Black and Gun Metal Gray. It also comes in a few different configurations. 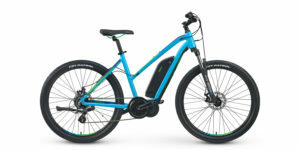 The base model of the Trail runs for $1,899, the Touring Package runs for $2,169 and includes a rear rack, integrated front and rear lights and fenders, and there’s also the option of upgrading the 13ah battery to a 17.5ah battery for an additional $299. 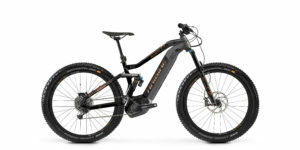 The Trail has a higher-than-normal top speed, upwards of 40 mph, placing it squarely outside the typical classes of electric bikes. The high top speed is cool for tearing through the trails, but it also means it’s likely illegal to ride in most places, making the Trail more of an off-highway vehicle (OHV) or private property experience as opposed to general cross country and trail riding. 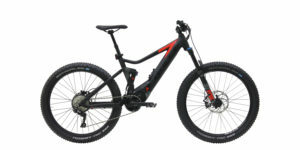 Riding this bike on the road could pose some legal issues, especially in the case of an accident, so please be careful. Because the Trail can be considered an unregistered vehicle (due to its top speed), there may be some serious legal ramifications if you were to hit another biker, pedestrian, vehicle or even damage public or private property. That being said, given the Trail only has a 350 watt mid-drive motor, I don’t think it’s likely I could hit the top advertised speed of 40 mph unless I was on level pavement in some sort of super aero position. However, I was able to get it close to 30 mph relatively easily and have ranked it as a 35 mph bike in the stats here. FLX started as FLUX back in 2016. They launched an Indiegogo campaign, asking for $50,000 and raked in an incredible $1.7 million from the campaign, plus an additional $400,000 from their website. Needless to say, they crushed it. 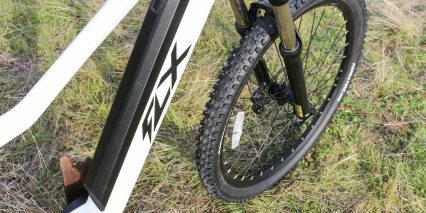 FLX has dropped the “U” and now they have some second-generation models being added to the lineup. So let’s dive into the Trail and see what this bike is all about. Driving the trail is a 350-watt mid-drive motor, called the Max Drive from Bafang. This is the second time I’ve tested a bike with this specific motor and I like it even more this time around. While it’s nowhere near as powerful as the 1,000-watt motor on the Blade, it is far quieter. It’s so quiet, in fact, that I have to strain to hear it running. The motor has a modest 80 newton meters of torque, but thats more than enough to help get me (as a 200 lb rider) climb some steeper hills. Riding the Trail with this motor is an entirely different experience than the Blade (obviously :). 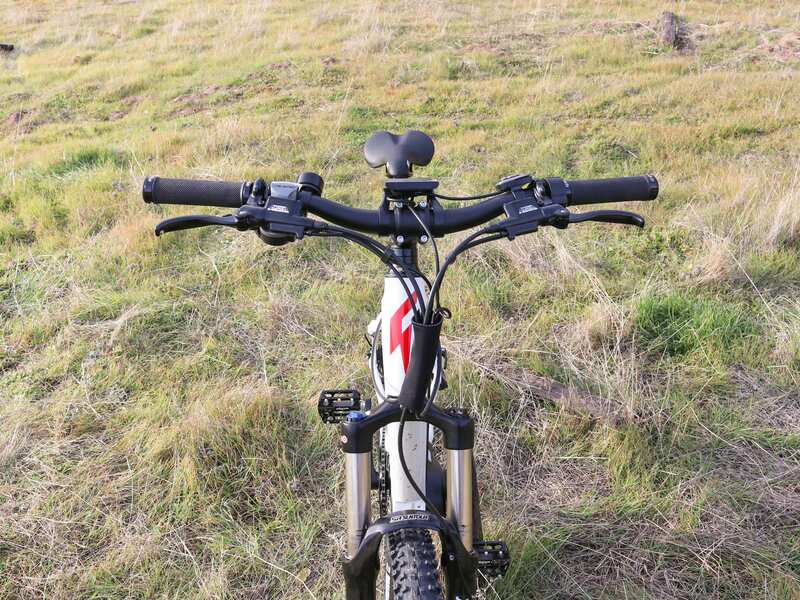 With the Blade, it felt almost like the bike could get away from me because of the immense power, but with the Trail, it feels more like it’s assisting me – like I’m in control vs. the bike being in control. I also appreciate the 350-watt motor as it still allows me to get my heart rate up, even when I’m on the highest pedal-assist mode. 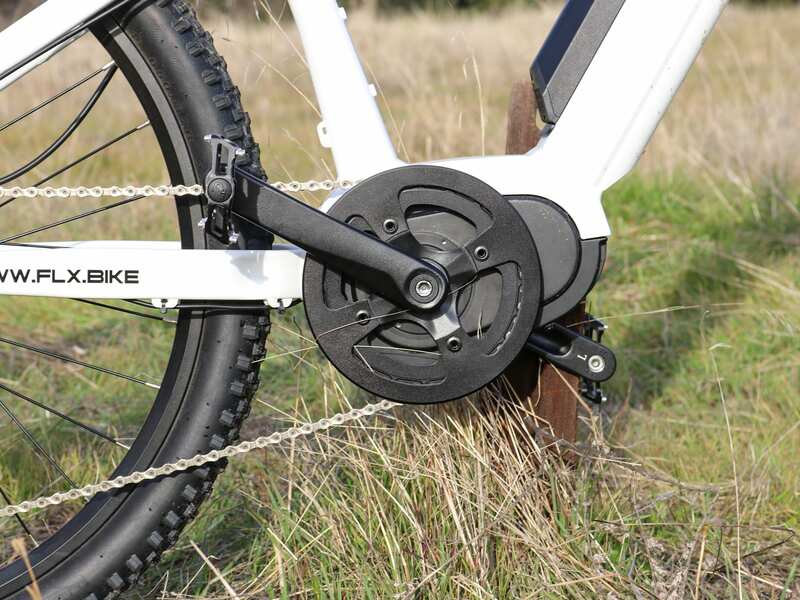 The torque sensor on the Trail works well with the motor, giving power almost immediately after I apply pressure to the cranks and stopping just as quickly when I let off the gas. Like I mentioned in the FLX Blade review, I deeply appreciate the torque sensor versus a cadence sensor as it allows for a finer degree of control when traveling at low speeds. This is especially important to me when I’m trying to navigate trickier terrain. I like that when I stop pedaling, the motor stops giving power. I’ve run into issues before with cadence sensors where I’m trying to creep along a ridge crest or something and the motor just doesn’t want to shut off. Thankfully, that’s not an issue at all with the Trail. With this particular setup, the motor will technically continue giving pedal assist up to 40 mph, but the top speed with the throttle is limited to 25 mph. 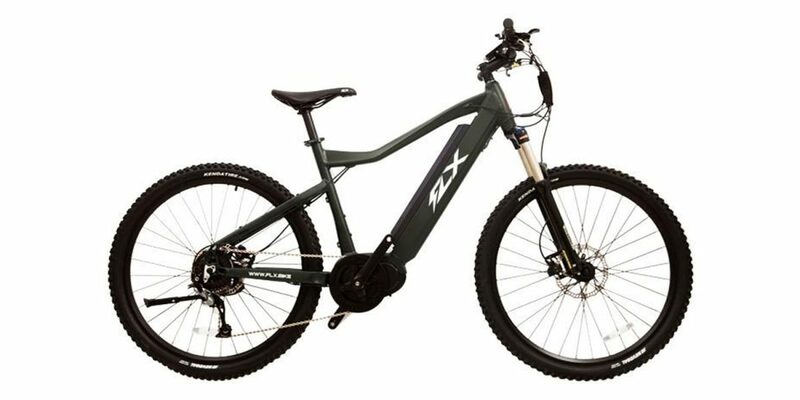 I like the trigger throttle design that FLX went with for this bike because it will stay out of the way compared to a twist throttle and allow you to focus on steering and grip if the terrain gets rough. 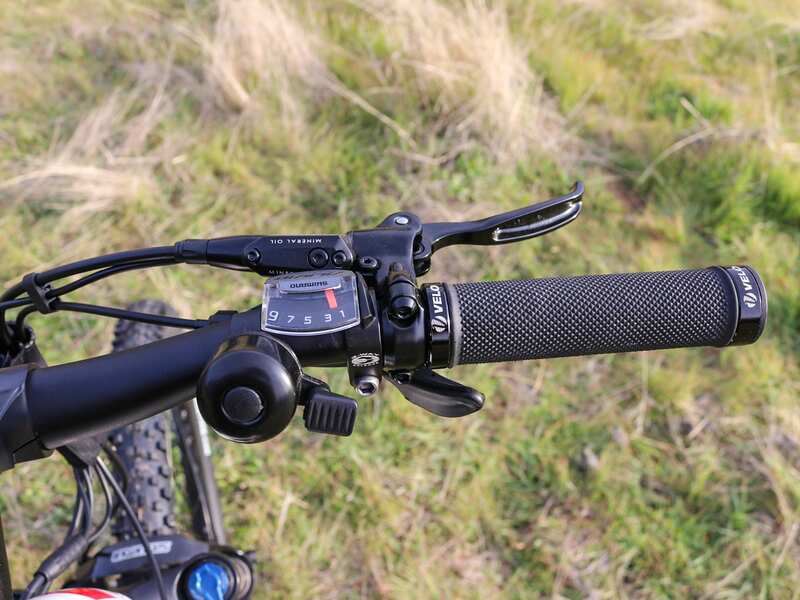 You cannot activate the throttle at standstill, which can be annoying when you go to start, but this does make it a bit safer to mount and dismount the bike when it’s turned on. I usually try to remember to turn off electric bikes with throttles before doing anything besides riding them, especially messing with the gears, fixing flats, or mounting them to my car rack. 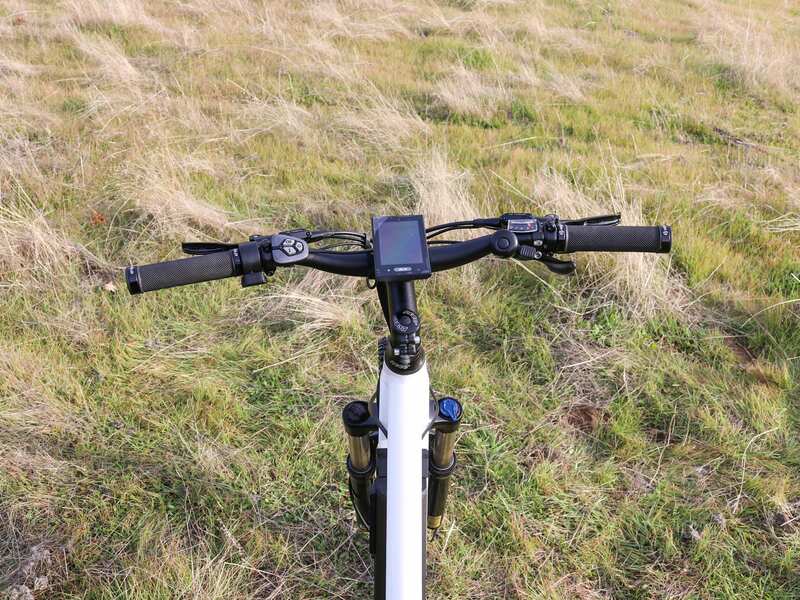 The way this throttle works is that you have to be moving upwards of five miles per hour before it goes active… I have tested other ebikes where you only have to go one or two miles per hour, and I preferred those. You may notice that at one point during the ride test in the video review, I was struggling to go fast enough (while climbing) to get the throttle active. It was a bit annoying and perhaps this is a setting that FLX can adjust in the future. Thankfully, the throttle can override all of the assist levels with 100% power once you are going fast enough. 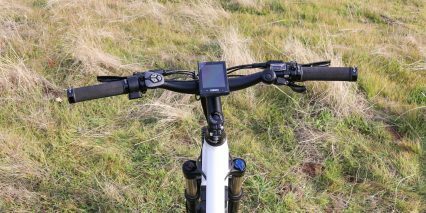 It’s a convenient way to zip up to speed or climb a hill without adjusting the assist level using the button pad. Braking with the Trail is a breeze. It’s equipped with 180 mm, dual-piston Tektro hydraulic disc brakes in the front and rear, with adjustable-reach, three-finger brake levers. Thanks to the motor inhibitors, the motor shuts off whenever the brake levers are depressed. This ensures I’m not fighting against the motor when braking, which could increase my overall stopping distance. There are moments when I have felt a bit of adrenaline and accidentally twisted throttles or kept pedaling even as I pulled the brakes, and motor inhibitors are really nice to cancel out any unwanted or unintended signals like this, especially at higher speeds. 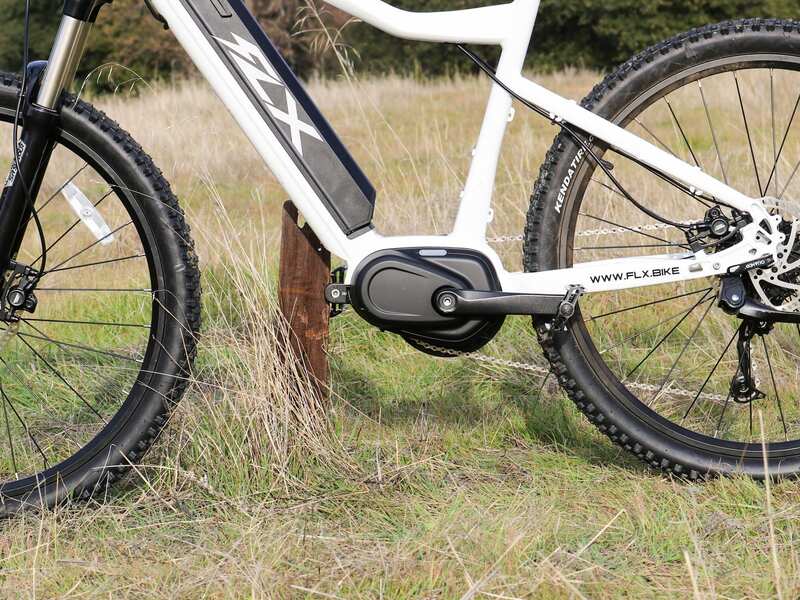 I like that FLX opted to go with 180 mm rotors since this is really meant to be an off-road trail blazer (probably why they named it the Trail). 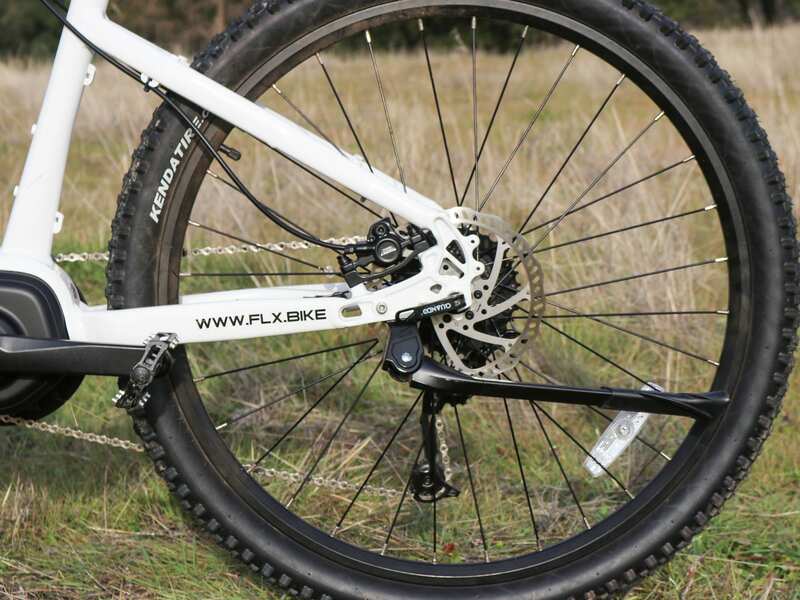 The larger rotor diameter helps to improve leverage over the wheels and allows them to cool faster. The brake levers are also adjustable reach, a feature I dig as I sometimes find the levers can pinch my hands when set too close. It’s nice to know I could let them out (or take them in if I was wearing thicker gloves) if I needed to. 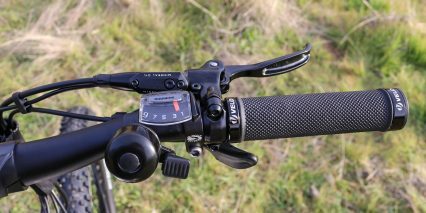 The Shimano Alivio trigger shifters work well enough, but unlike the Blade, there doesn’t appear to be a shift sensor with the Trail. So the motor will continue to run when you switch through the gears. With only 350 watts of power and 80 newton meters of torque, there will of course be far less strain on the components compared to the much more powerful Blade, but I could still run into problems if I don’t let off the gas before shifting. 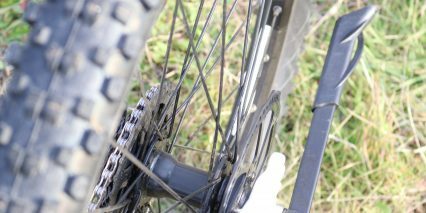 Over time, the chain, sprockets, and derailleur will take some abuse if you don’t ease off when shifting. 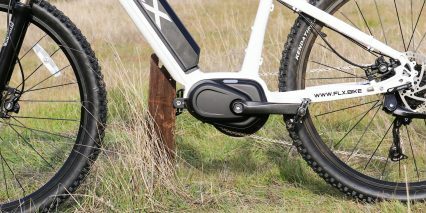 The Trail also loses the frame-mounted chain guide featured on the Blade, but retains the aluminum bash guard and narrow-wide chain ring tooth setup as mentioned earlier. The frame itself is made from aluminum alloy, offering an average curb weight of 50 pounds. And, since the motor is located low on the middle of the frame, and since the battery is on the down tube, it’s pretty well balanced. 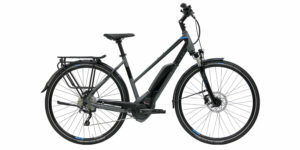 There’s probably two main reasons this bike is so much lighter than the Blade: It has a much smaller motor and battery. 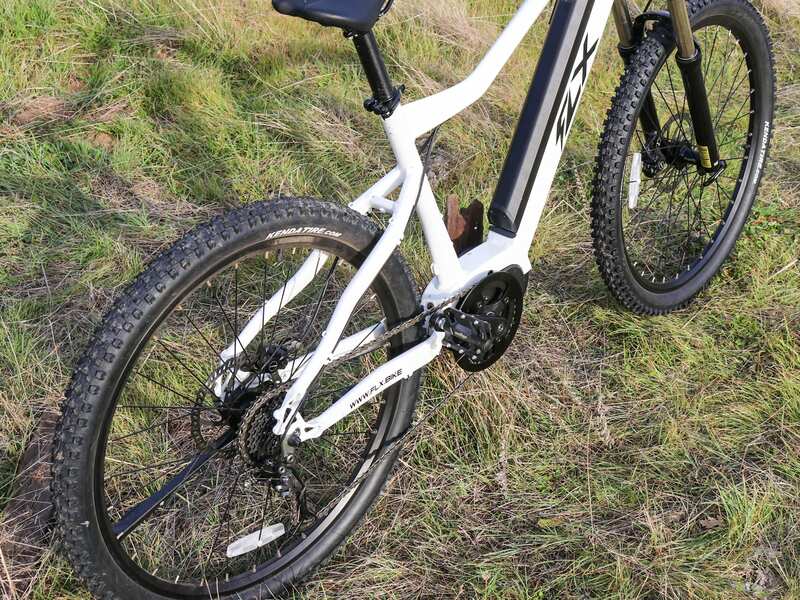 The roughly 10-pound difference between the Trail and Blade is definitely noticeable when riding and I was able to flick the Trail around pretty easily during the ride test. The frame also looks pretty cool (to my eyes) and was custom designed by FLX to take a beating. The Trail I tested was the Electric White color, which stands out nicely against pretty much all backgrounds and would be more visible in dark conditions. While the Electric White color does stand out, I might lean more towards the Carbon Black myself since everything is all one color. With that setup, the battery and cables really disappear into the frame and it has a stealthier look. One of my biggest complaints about the frame though is the lack of rear suspension. 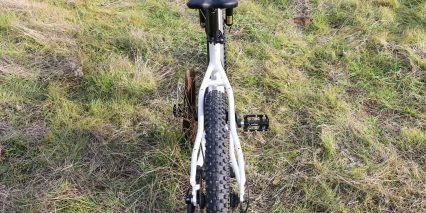 While I could add a seat post suspension, it’s not the same as an integrated rear suspension. 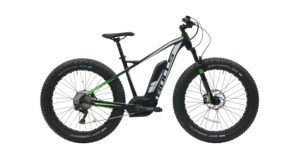 Additionally, the tires are only 2.1 inches wide, and since this bike doesn’t have boost, I can’t add plus size tires, which would increase the overall air volume and make for a cushier ride. FLX does offer a seat post suspension of their own, but most aftermarket seat post suspensions with a 31.8 mm diameter should also work (or you could use a shim to hit this size, I was a little surprised at my own measurements of 31.8 mm because it seems like 31.6 mm is much more common, feel free to correct me in the comments below). 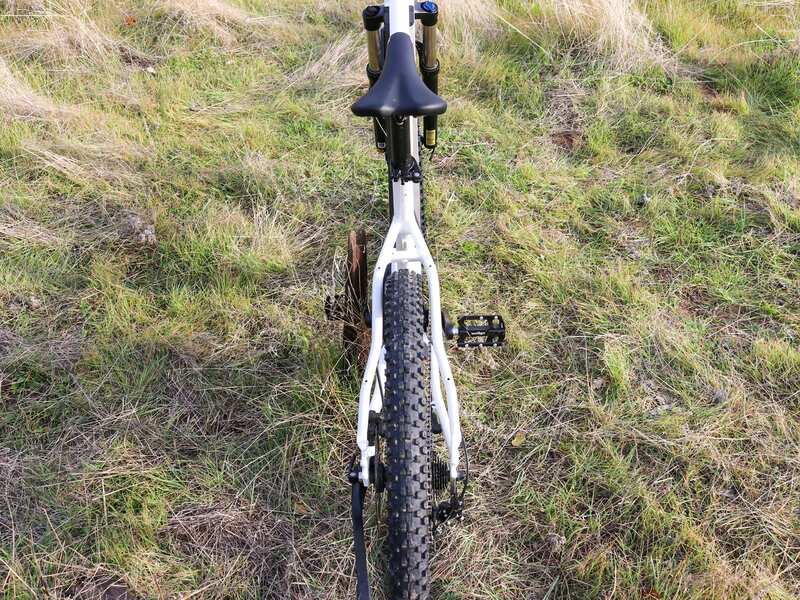 The frame also has fender bosses, water bottle bosses and rear rack bosses, which are great for those who want to pedal through the city on the Trail (but just remember the potential legal issues of doing so). The locking, integrated battery fits snugly to the frame and doesn’t bulge out past the sides. 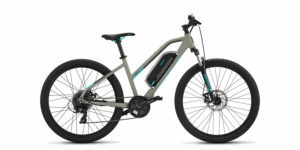 It’s a 36 volt, 13 amp hour battery, but there’s also that option of the larger 17.5 amp hour battery for those who want to ride further (and I love that that pack does not bulge out past the sides). 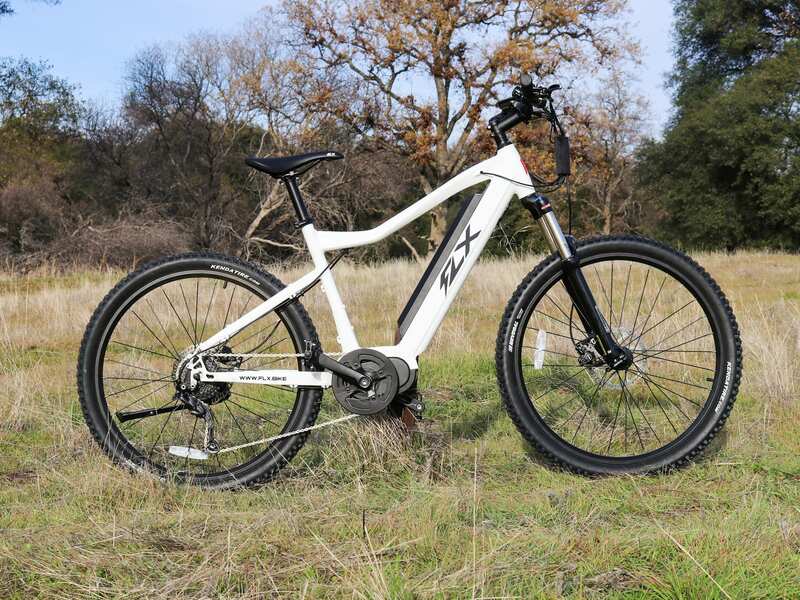 FLX estimates the range at around 60 miles in the lowest pedal assist setting with the 13ah battery, but I think realistically I would get around 20 miles with the way I ride. I really appreciate that the battery and display console up at the handlebars have USB ports for charging accessories on the go! You could use this to maintain the charge of your smartphone while using GPS and then take the battery pack off and use it to power other portable electronics while camping etc. 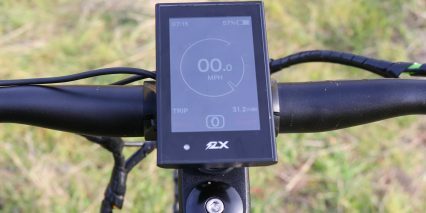 Mounted in the middle of the handlebar is the FLX-branded Bafang control center, which offers tons of information. 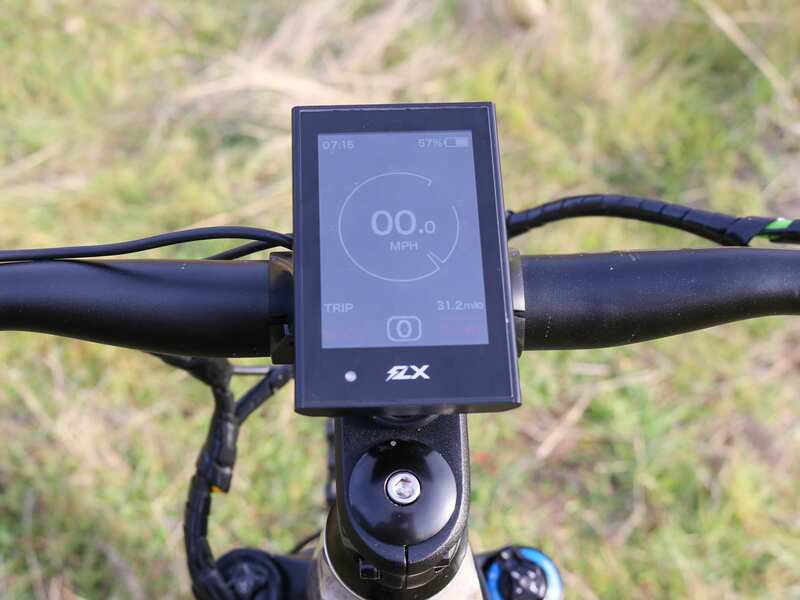 This control center displays current speed, top speed, average speed, range, battery level, pedal assist mode, wattage output and quite a bit more. More importantly, I can see it in direct sunlight! The only downside to this display is that it’s not easily removable, so leaving it unattended in a public place could subject it to tampering. Another cool thing about this control center is the extensive configuration options. I can set up a passcode to keep children or anyone else from accessing the electronics. I can also change the top speed to whatever I like. So if I want to tone this bike down, that’s an option. I think the Trail is a good choice for those looking for a fun off-road electric mountain bike that’s capable of reaching higher top speeds. 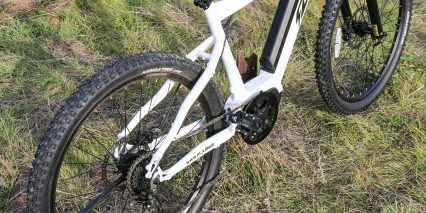 While there’s a few compromises to hit that lower price, like boost and rear suspension, it still feels more than capable of tackling pretty serious trails. 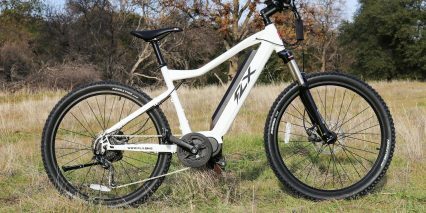 This was a fun bike to test and I’d like to thank FLX and especially Rob for partnering with me on this review and for coming all the way out to California to hang out! 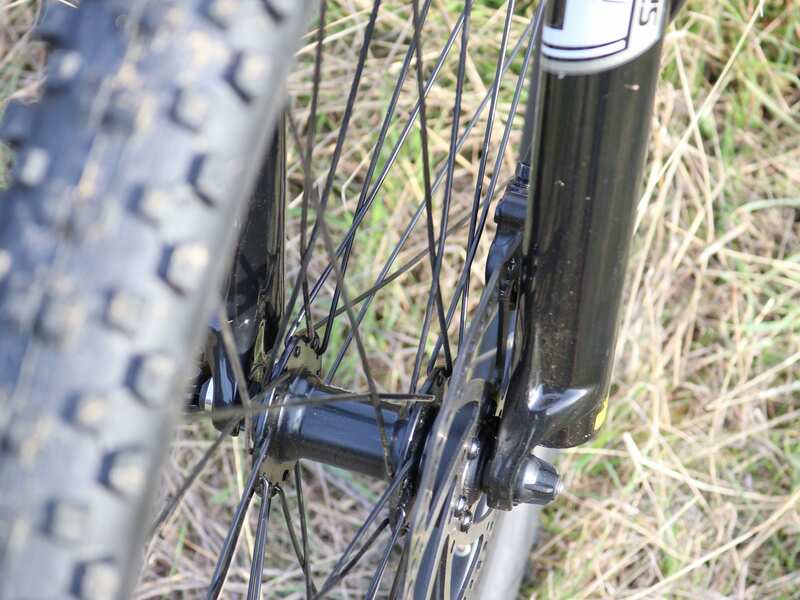 As a closing thought, it appears that the fork used here is a spring design vs. air, this increases the weight and limits adjustability but also saves costs. 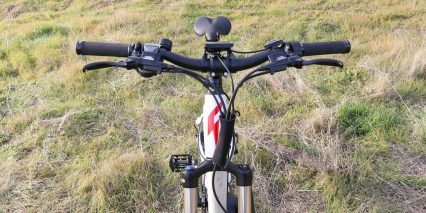 It does offer preload adjust, but no rebound, so it could feel bouncy and is just a bit cheaper than you’d get from a nicer mountain bike suspension fork. 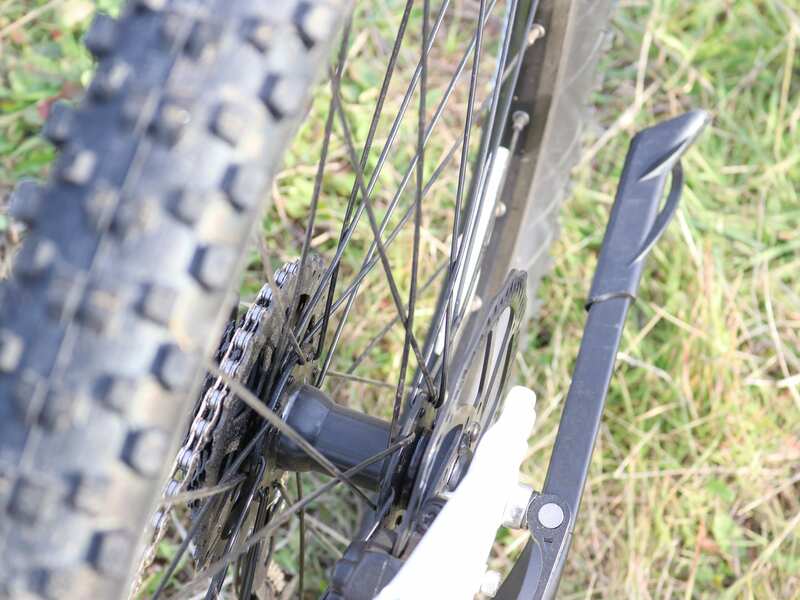 Had they gone with an air fork or a more adjustable spring with hydraulic damping, the overall weight of the bike would be lower or the performance might be more fine-tuneable. 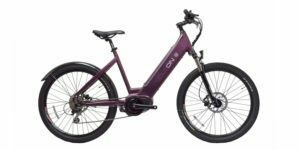 I would consider the 50 lb weight of this e-bike to be a bit high considering that the bike we reviewed didn’t have the rack or lights. 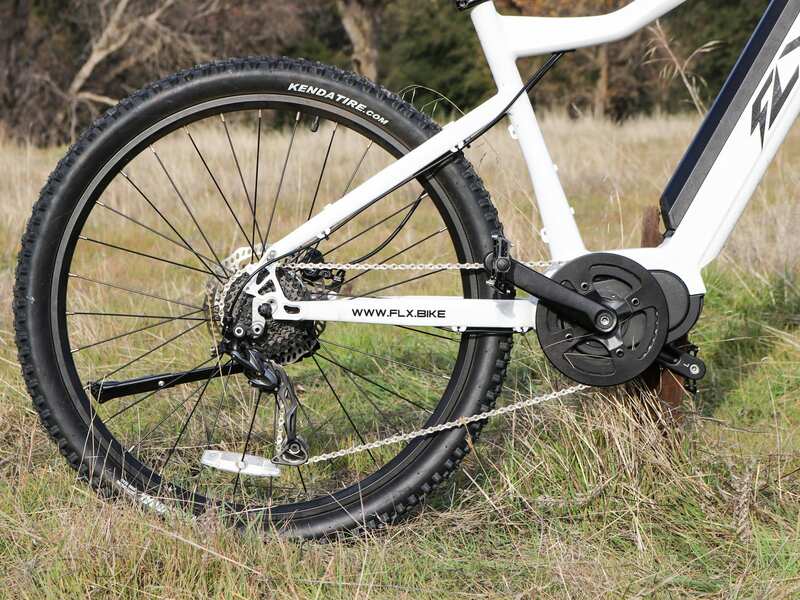 For a naked hardtail with standard width hubs and average sized tires, it’s not super lightweight, but even the stock sized battery is a touch above average in terms of capacity and the weight is all centrally located and fairly low on the frame. I love that it has room for a bottle cage on the seat post, and that they included bosses here to mount one easily. 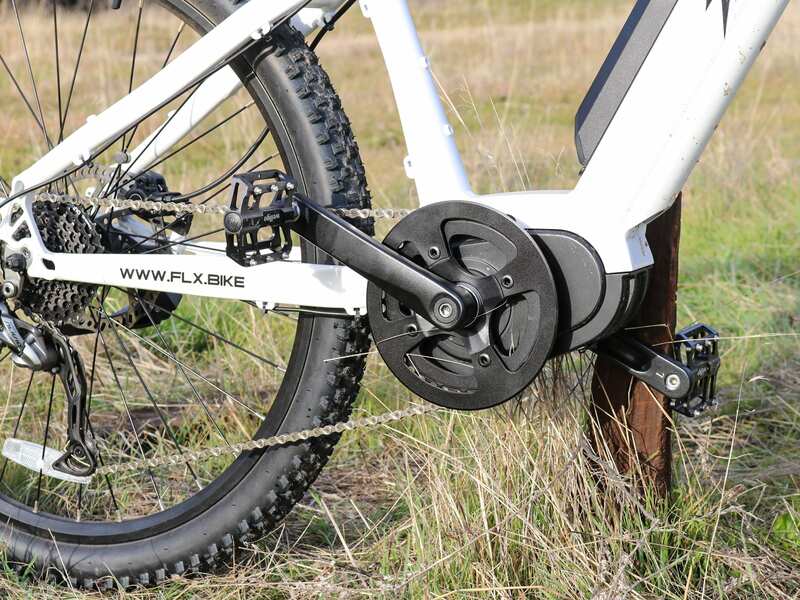 The FLX ebikes look impressive from a small start-up. 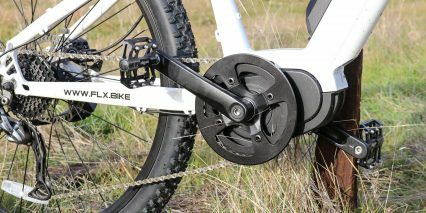 The Blade and Trail look like the same basic frame that Magnum uses on their Magnum Peak but it’s a rear geared hub drive. 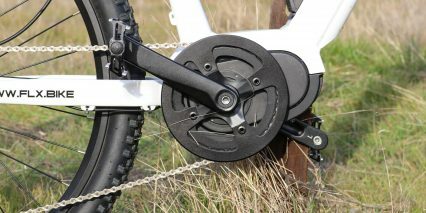 I just have the impression the mid-drive system is best for slower speeds and lower speed climbing and that hub drives are superior when riding long distances at high speeds (15 – 30 mph) because the torque is directly applied to the rear wheel (mid drives benefit from gear ratios at low speeds but once your riding at high speeds the front to rear chain ring ratios effectively reduce torque delivery to the rear wheel). 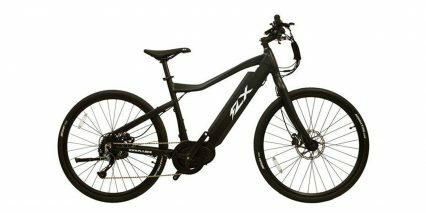 I still like how there is room in the market for some innovative companies like FLX that want to push the legislative boundries that limit the adoption of eBikes for transportation in the US (time is money so anyone commuting on an bike is going to want to sustain speeds in the 25-35mph when the road is smooth and clear). I my opinion, anyone commuting on a bike sharing the road with cars that isn’t going at least 20mph is just an organ donar in the making. The danger of going fast reduces the likelihood of being hit by a car and thus improves safety overall. Sure, a biker can still wreck on his own but most wrecks under 35mph aren’t going to be be that seriously injured (it’s the impact with autos that kill most bikers). 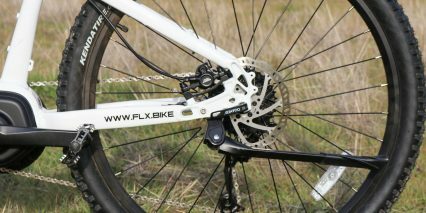 Hey guys, Thanks for the great review on the FLX Trail here. I am considering this bike for my wife, who is 5’4″ tall. Unfortunately, the Trail only comes in one frame size (19″). Can you offer any opinion regarding how you think it will fit her? 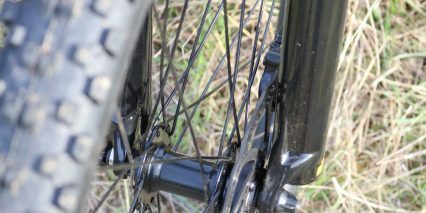 She currently rides a 2012 Cannondale Flash 29er, Medium frame size. I’m having trouble interpreting the specs wording in order to accurately compare the two bikes sizes. For what it’s worth, she does a variety of riding but nothing ever aggressive; low key paved bike trails, hard packed dirt trails and a blue or green single track every once in a while. 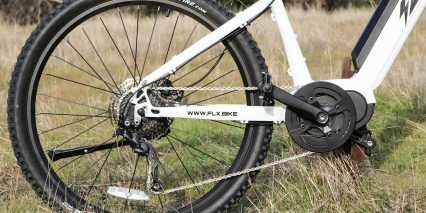 Do you think the FLX Trail frame size will work for her? Hi Skot! Great question, thanks for sharing the details about her height and current bicycle, that really helps. The main thing to look at is frame stand over height, which Brent measured at ~28.5″ for the FLX Trail. If this is taller than the current stand over, then your wife may struggle to mount and control the bike at stops. We measure this by going from the ground up to the top tube just in front of the saddle nose. This is how high you need to be to “stand over” the frame without hitting your crotch. Thanks for the feedback, I just updated the review. 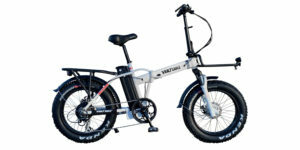 This ebike was covered by Brent and I didn’t interface with the company directly, my apologies for some rough edges and possible incorrect details, Dean. Sorry folks, but anyone thinking a 350 watt motor, with only a 36 volt design is going to allow them to hit 28 mph on a regular basis, is kidding themselves. Unless of course you are going downhill all the time. the claimed ‘750 watt peak’ is what is known as an instantaneous measure of power when the motor is drawing a higher level of amps such as in a sudden hill climbing situation. Its really sort of false advertising , as all motors have peak draws above their nominal wattage rating. 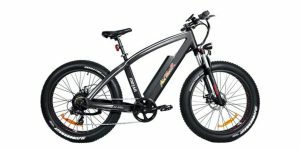 If you want to go 28 mph on a regular basis, you will want for sure a 48 volt motor, battery combination. Thanks for the feedback, Mike! I speak with different companies often, and some purposefully limit speed in order to help make their motors last longer. I cannot speak to FLX performance directly because this review was conducted by Brent… and he was still learning when he did it. I have tried to edit and touch up the written portion but comments like yours go a long way to set expectations. 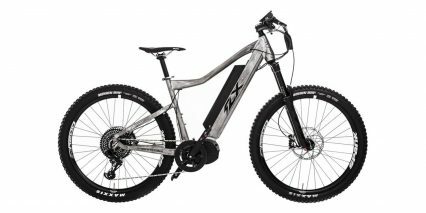 Do you own one of these ebikes or have you had experiences with similar builds? The thumb throttle top speed is 20 MPH, maybe it was once 25 but mine is 20, Inoticed this error was made a couple time on the video too, for what it’s worth. 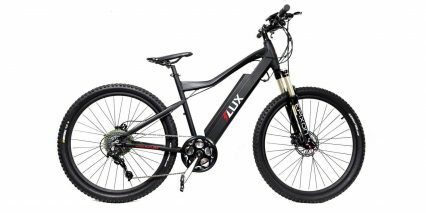 FLX seems to have a new Blade with 750 watts & a 20 MPH setting for legal use, ALSO according to their website all FLX Bikes have had a pretty major price increase. Interesting, thanks for the feedback Alan! How are you liking your FLX Trail so far? Perhaps the company has been struggling to keep inventory and is adjusting to meet demand with their remaining stock?